본 논문은 지방선거에서의 표 매매(賣買) 문제를 청도군의 사례를 통해서 연구한다. 지방선거에서의 표 매매는 후보자, 유권자, 선거운동원들 간의 높은 수준의 신뢰가 없이는 불가능하며 이러한 의미에서 집합행동의 성공이라고 볼 수 있다. 지방의 사회적 자본은 후보자와 유권자, 후보자와 선거운동원 사이의 정보의 비대칭성 그리고 고발자에 대해 국가가 제공하는 상당한 금전적 보상 등 표 매매를 어렵게 만드는 여러 요인들을 극복하는데 결정적인 역할을 한다. 사회적 자본과 이를 바탕으로 한 호혜성의 규범은 표 매매의 상황에서 왜곡된 책임성(perverse accountability)을 만들어 낸다. 결속적 사회적 자본(bonding social capital)은 제공된 금품을 거부하기 어렵게 만들고 운동원들의 기회주의적 행동을 통제하는 역할을 한다. 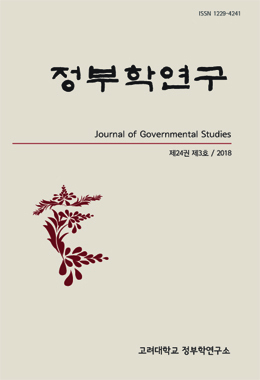 This paper studies the problem of vote buying in Korean local elections focusing on the city of Cheongdo. The vote buying in local election is not possible without a high level of trust among candidates, voters and campaign workers. In this sense vote buying implies a success of collective action. The factors that make vote buying difficult include the information asymmetry between candidates and voters and between candidates and campaign workers, and the government`s large financial rewards to those who report vote buying. Local social capital plays a crucial role in overcoming these difficulties. Social capital and the norm of reciprocity arising from it generates perverse accountability,. The bonding social capital makes it difficult for voters to refuse to accept money. The bonding social capital also plays a critical role in controlling the opportunistic behavior of the campaign workers.